Over the Christmas holidays, the house On Sutton Place was bursting with people and good food. Our son, daughter-in-law, and granddaughter were here for ten days…and our daughter and her boyfriend were here on the weekends. For someone who spends most days alone, the conversation and company felt like the biggest blessing of all. 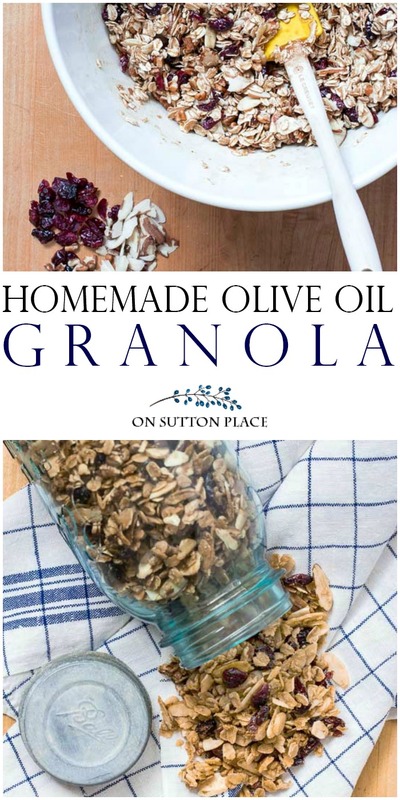 One morning, my son commented that they loved a homemade olive oil granola recipe that my daughter-in-law got from a friend. They said they put it on yogurt, cereal and even in their pancake mix. I was excited to try it and was not disappointed. 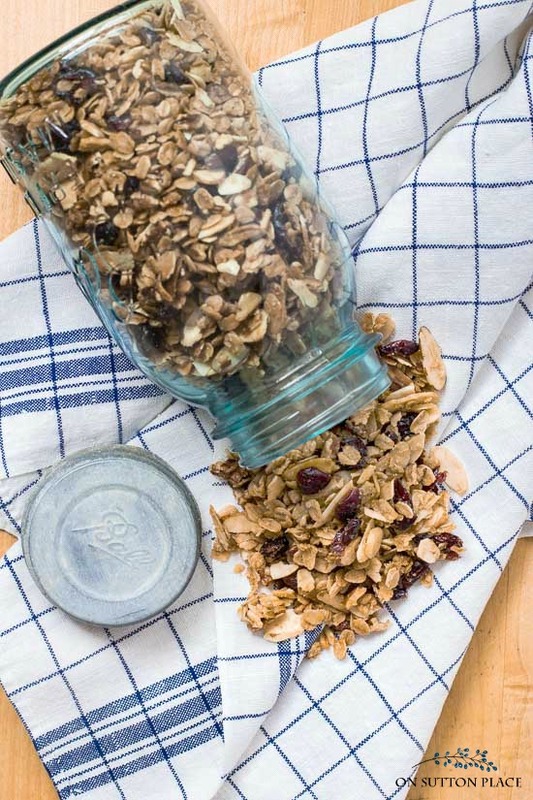 This is the tastiest granola recipe ever and super easy to make. This homemade olive oil granola recipe fits on a half sheet pan (I used this one) and filled 2 1/2 quart-sized mason jars. Because I was afraid I would eat it all by myself, I gave one jar away! The recipe can be cut in half if you don’t need the full amount. In a large bowl, combine oatmeal, almonds, pecans, and craisins. Stir so it's well mixed. In a smaller, separate bowl, whisk together maple syrup, olive oil, brown sugar, salt, and cinnamon. Pour maple syrup mixture over oatmeal mixture. Stir well so all of the oatmeal mixture is covered with the syrup mixture. Pour out on a large, rimmed baking sheet that has been sprayed with non-stick spray. Spread into a single layer. Bake for 45 minutes. Remove from oven at 15 minute intervals and stir. Mixture will be golden brown and well toasted when done. Cool completely. Store in jars or other airtight container. 1 extra cup of ingredients can be added without increasing the amount of syrup mixture. Any other type of dried fruit. After the second stirring, I didn’t think it would be done in just fifteen minutes more. That’s when the scent of cinnamon began to fill my kitchen and when I pulled the tray out of the oven after 45 minutes, the granola was perfectly toasted. I sampled it when it was still warm and decided it was the best granola I’ve ever had! I am beginning to settle into 2018. I haven’t talked much about the new year or resolutions. I told my email subscribers that I don’t make resolutions anymore because I hate feeling like a failure! I do, however, like all of you, have hopes and dreams. The one thing I hope, more than anything, is that you all are abundantly blessed in 2018. Some blessings are easily identified, while others come in the form of unanswered prayers. I’m determined to be grateful for both kinds…and I hope you are determined as well. You look so pretty and the granola sounds yummy.Thank you for the recipe. I can hardly wait to try this recipe. I have several favorite granola recipes and the latest batch is about gone. The olive oil is an unusual ingredient and I have some blood orange infused olive oil that I think will work well. A belated Happy Birthday to you Carol! Just wanted to say that I made this granola yesterday, and it was delicious! I substituted coconut sugar (organic and unrefined) for the brown sugar, and added one cup of coconut flakes. It was amazing! So addictive…I had it in a bowl with some plain Greek yogurt and a splash of almond milk. Mmm…so good! Totally agree that it is addicting! How long will this keep in a sealed canister or mason jar? Just read it will keep up to 2 weeks. Thanks! LOVE this (and all of the posts you share on your blog)! Please thank all involved for this recipe! I’m going to make it today!!!!!!!!!!!!!!! Thanks Ann for this delicious granola recipe, I made this today on a “VERY” cold northwest Ohio afternoon, the smell filled the house with goodness and the taste is amazing!! This recipe is a keeper!!! This sounds so delicious. 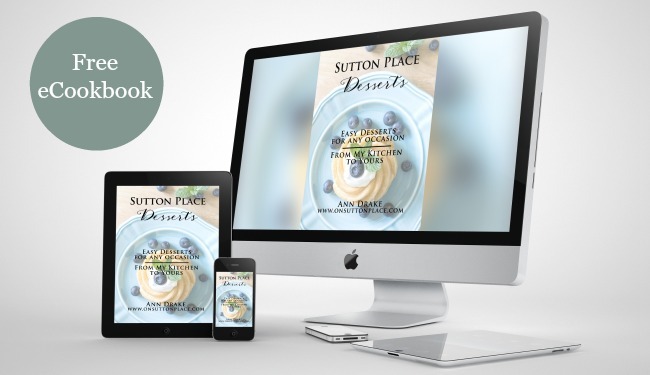 I love recipes with ingredients I already have on hand. Dear Ann, iT is juist wonderful to meet someone in another country, just like this. Your blog is warm and beautiful and it is nice to reed your blog. You write as if I sit there at the kitchentable : ) just great. Oh my….I can’t wait to make this!! I’ve pinned it until I can get all of the supplies together. Thanks for sharing!! The granola recipe looks fabulous! It would make a great gift! What is it’s “shelf life”? I made some resolutions, but mine are realistic. Good luck with your’s. Happy New Year from cold Alabama! It should last for up to two weeks if stored in an air-tight container. Enjoy! Thanks for sharing. Wishing you a blessed and healthy 2018! Granola is the perfect food. Thanks for the recipe! I make one very similar using coconut oil and always include coconut flakes. It is my everyday lunch, with fruit and yogurt for most of the year. I’m very glad you had a lovely family time over Christmas. It is definitely your turn for some good stuff! Thanks for all the lovely goodies that you share with us, and may 2018 bring YOU laughter and grace. thankyou! and to your DIL. Will be trying it for sure. Have everything I need to make this today,sounds delicious.Love to add to my morning yogurt. Thanks for sharing. Thank you for sharing. Happy New Year! Making this tonight for family coming in for the weekend. It sounds like you had a lovely holiday. So happy for you. I LOVE homemade granola! Can’t wait to try this recipe. Just want to send you a “thank you” with a virtual big hug for all you do for us! I’m glad you had a great holiday filled with good company. I feel gratitude to have you among the bloggers I follow; it’s really a blessing! Happy New Year and all good things your way! Happy 2018! 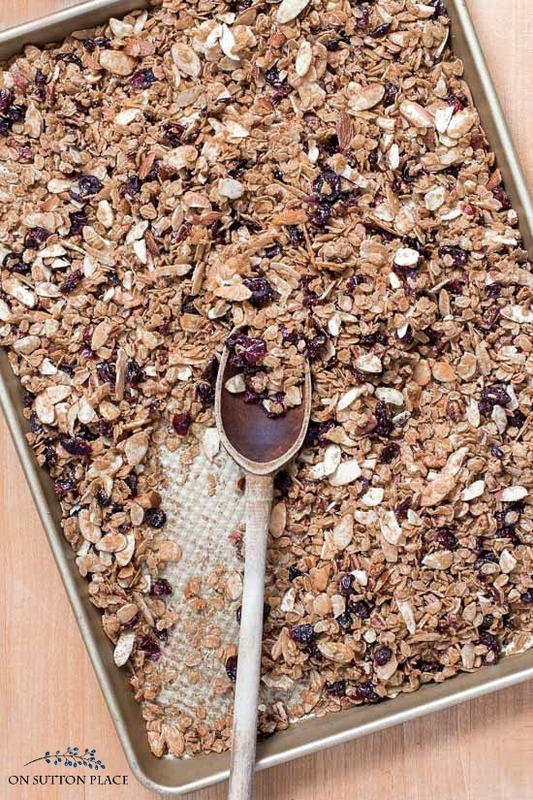 Just pinned the granola recipe…sounds amazing! Thank you for sharing. Wishing you laughter and grace, right back and many blessings for 2018. Absolutely love your blog. 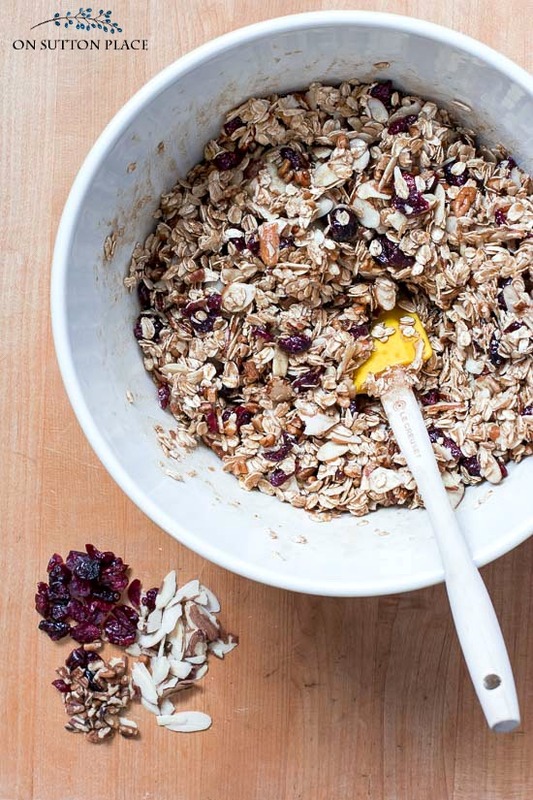 And the granola recipe – am going shopping today for more oatmeal. Happy New Year, Ann, I love granola & yogurt, but find most granola I’ve bought to be just awful! This recipe seems to have just enough sweetness. Is there a particular type of olive oil you used? Thank you for sharing. I can’t wait to make this! Happy New Year! This looks delicious and easy – will have to try! Going to make the granola ! Happy 2018. I can’t wait to see what you develop in the stationary line-I’m hoping a daisy may be involved! Thanks for the recipe, Ann. Sounds like one I make and I definitely add coconut flakes. Yummy! Also thank you for reminding me that some blessings aren’t immediately identified. Good thought to ponder. Wishing you all good things in 2018 and a more peaceful, kinder world to all. Oh, I agree with you, Mary, a daisy would be just the thing!!! Or maybe seven? So excited to try this! I’ve all the ingredients on hand, Thank you for sharing. Sounds scrumptious. Love New recipes and its healthy for us. Happy New Year and praying for good health and peace to all. 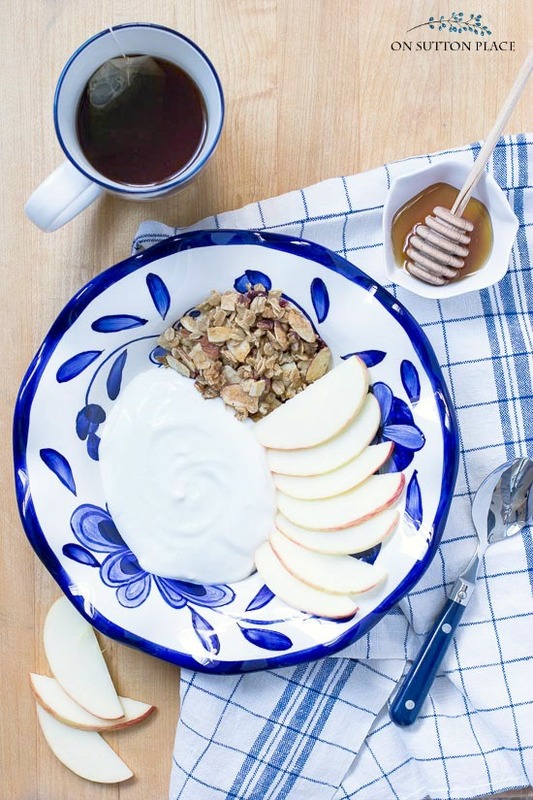 I love homemade granola but I have never made it with olive oil… I will definitely try this. Thanks and Happy New Year Ann! This sounds delicious! I love that it is easy to change up the nuts and fruits as there are some we cannot have due to food sensitivities. Thank you for sharing.